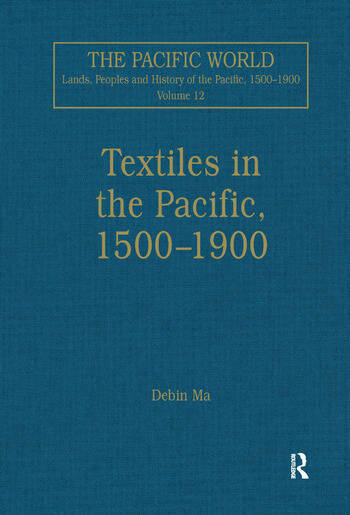 Textiles in the Pacific, 1500-1900 brings together 13 articles which include both classics and lesser-known but important works related to the trade and production of textiles in the Pacific region, extending from the tip of Northeast Asia to the other end of South America and Australia. Collectively these articles bring out two central themes, as highlighted in the introduction. First, there is the leading role of textiles in linking up the economies across the Pacific in the era before the 19th-century rise of steam-engine-powered global integration. Second is the crucial role of textile manufacturing and trade in the early stage of industrialization for most of the developing Pacific economies after the 19th century. The volume also reflects both revolutionary shifts in paradigms and revisions of traditional consensus, and seeks to present a more balanced account of global trade and market integration in the early modern period. Contents: Introduction. Part I Silk across the Pacific: The great silk exchange: how the world was connected and developed, Debin Ma; Silk for silver: Manila-Macao trade in the 17th century, Dennis O. Flynn and Arturo GirÃ¡ldez; The mechanics of the Macao-Nagasaki silk trade, Michael Cooper; Silk raising in colonial Mexico: preliminary schemes, the decline of silk raising, Woodrow Borah; Silk culture in California, E.O. Essig. Part II Flows of Technology and Institution: East and West: Pre-modern European silk technology and East Asia: who imported what?, Claudio Zanier; Silk-reeling in modern East Asia: internationalization and ramifications of local adaptation: in the late 19th century, Kazuko Furuta; Transplantation of the European factory system and adaptations in Japan: the experience of the Tomioka model filature, Yukihiko Kiyokawa. Part III Cotton and Cloth along the Pacific: The cloth trade in Jambi and Palembang society during the 17th and 18th centuries, Barbara Watson Andaya; Textile displacement and the status of women in Southeast Asia, Norman Owen; Inchon trade: Japanese and Chinese merchants and the Shanghai network, Kazuko Furuta; Industrial concentration and the capital markets: a comparative study of Brazil, Mexico, and the United States, 1830-1930, Stephen H. Haber. Part 4 Wool in Australia: A century and a half of wool marketing, A. Barnard. Index. Debin Ma is a Fellow in the Graduate Program of the Foundation for Advanced Studies on International Development, and Associate Professor at the National Graduate Institute for Policy Studies, Tokyo, Japan.